Kandinsky crater lies near Mercury's north pole, and may have hosted water ice. MESSENGER spacecraft's Wide Angle Camera broadband image appears at left, outlined in yellow, and superimposed on an MDIS polar mosaic. The view on the right shows the same image but with the brightness and contrast adjusted to show details of the crater's shadowed floor. Image released Oct. 15, 2014. The first-ever photos of water ice near Mercury's north pole have come down to Earth, and they have quite a story to tell. The images, taken by NASA's MESSENGER spacecraft (short for MErcury Surface, Space ENvironment, GEochemistry, and Ranging), suggest that the ice lurking within Mercury's polar craters was delivered recently, and may even be topped up by processes that continue today, researchers said. The top image shows a view of Berlioz crater, with the areas that contain radar-bright material marked in yellow and persistent shadows marked in red. The middle image, acquired a few hours later, shows details within the shadowed crater. A distinctively darker region sits on the crater's floor, which corresponds well with the radar-bright and shadowed regions as shown in the bottom image. Image released Oct. 15, 2014. In late 2012, MESSENGER confirmed those observations from orbit around Mercury, discovering ice in permanently shadowed craters near the planet's north pole. MESSENGER scientists announced the find after integrating results from thermal modeling studies with data gathered by the probe's hydrogen-hunting neutron spectrometer and its laser altimeter, which measured the reflectance of the deposits. 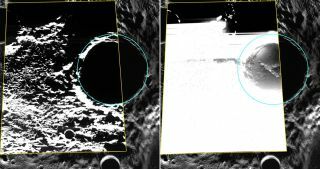 And now the MESSENGER team has captured optical-light images of the ice for the first time, by taking advantage of small amounts of sunlight scattered off the craters' walls. "There is a lot new to be learned by seeing the deposits," said study lead author Nancy Chabot, instrument scientist for MESSENGER’s Mercury Dual Imaging System and a researcher at the Johns Hopkins University Applied Physics Laboratory in Laurel, Maryland, in a statement. For example, the texture of the ice at the bottom of Mercury's 70-mile-wide (113 kilometers) Prokofiev Crater suggests that the material was put in place relatively recently rather than billions of years ago, researchers said. Images of other craters back up this notion. They show dark deposits, believed to be frozen organic-rich material, covering ice in some areas, with sharp boundaries between the two different types of material. "This result was a little surprising, because sharp boundaries indicate that the volatile deposits at Mercury’s poles are geologically young, relative to the time scale for lateral mixing by impacts," Chabot said. Earth's moon also harbors water ice inside permanently shadowed polar craters, but its deposits look different from those on Mercury, researchers said. This could be because Mercury's ice was delivered more recently. "If you can understand why one body looks one way and another looks different, you gain insight into the process that's behind it, which in turn is tied to the age and distribution of water ice in the solar system," Chabot said. "This will be a very interesting line of inquiry going forward." The new study was published online today (Oct. 15) in the journal Geology.